There’s a lot going on these days, am I right? This month, in addition to regular dispatches on Rain in the Forecast (which involves taking Rain to agility class and practicing our homework), I’m learning to knit by a class I’m taking at local knit shop Starlight Knitting Society, I’ve returned to a regular yoga class after an unexpected two-month absence, and I’m cooking up fundraisers (see above and below). But I’m still reading. There’s a new occupant in the Oval Office this year, and if you’re having as hard a time adjusting to that as I am, perhaps this piece will be of interest to you. 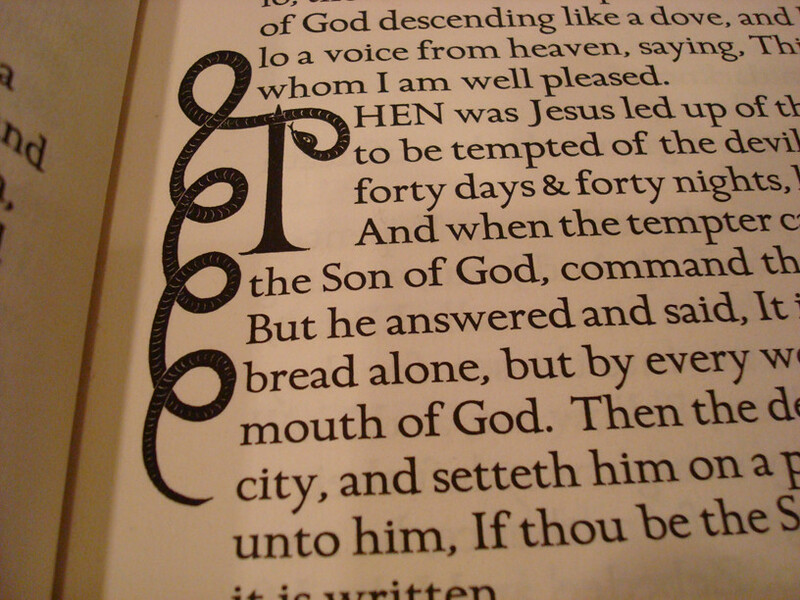 It’s long-form, but largely worth it. Inspired by the amazing things happening these days in US government, I’m selling some pencils. Proceeds will go to the Center for Investigative Reporting in Emeryville, CA. He was seven days away from completing a glorious victory lap around the sun, but sadly Atticus Finch Andrews died Friday, May 29, 2015. You may remember him from Doggy Cancer, Bad Juju, and Constructive Wallowing. Atticus was never much of a reader, but books were important in his life. Besides giving him a name, books were ultimately responsible for his living in Canada and many of his outdoors adventures. 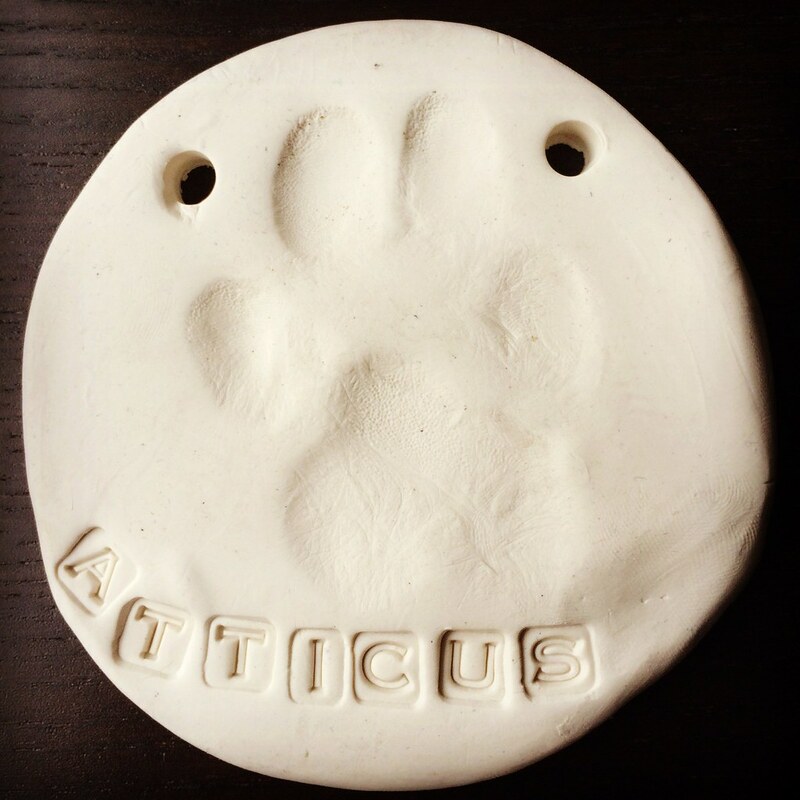 Atticus had the kind of life that left no room for regrets at the end. He was a great dog, and he will be missed for years to come! I Need a Copyedit, Charlie Brown! Yes, this is real. Normally I wouldn’t bother posting something like this, but it’s sad to see everyone’s favorite beagle can write a la Edward Bulwer-Lytton but struggles with the greengrocers’ apostrophe. It happens to the best of us, little guy! As of press time, no statement on the issue had been released from Snoopy’s spokesbird. It seemed like a good idea at the time. I needed a new goal to tackle, ideally some sort of physical activity I could do with Atticus. It seemed pretty natural to buy a copy of William Sullivan’s classic 100 Hikes in Northwest Oregon and make a goal of checking off every hike in the book. William Sullivan has a booth at Wordstock each year, so I bought my copy from the hiking guru himself a few weekends ago, which he signed for me. Not long before our first planned hike, I did the (very easy) math. Even if we tackled one hike per week it would take nearly two years to work our way through this book. That’s quite a commitment for a “fun” goal! Not to mention that this book includes such “hikes” as climbing Mount St. Helens. Doing that requires obtaining a permit, as only a certain number of people are admitted up per day. Mount St. Helens is only considered a difficult hike because climbers don’t usually need mountaineering equipment, but it does count as climbing a glaciated peak which will earn you entrance into Mazamas. Another daunting hike in the book: Nesmith Point. I’ve dreamt about someday hiking to Nesmith Point, but imagining myself doing so as “just another hike” seems unrealistic. This is a route that is used by mountaineers in the off-season for training. It’s some pretty serious climbing: 3706′ in about 5 miles. YIKES. So far I’ve done two hikes, both with Atticus. Not all of the hike locations allow dogs. Since I’m now needing to leave him alone five days a week I’ve been choosing hikes on which he can accompany me. We went to Memaloose Lake and South Fork Mountain on Atticus’ birthday a couple of weekends ago. 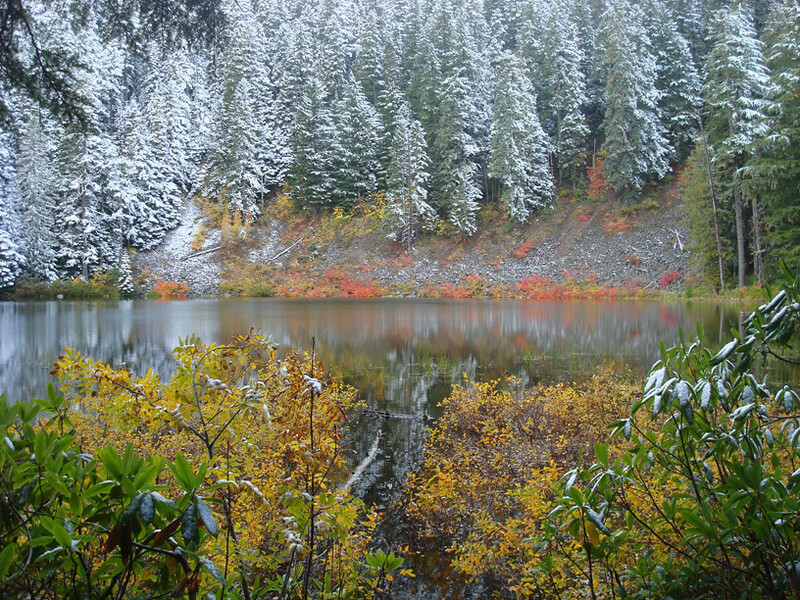 Hiking to the scenic lake was fairly uneventful, but the additional mile from the lake (where the snowline was) to the summit was a bit trickier. Not only was the trail unmaintained, but the snow occasionally left me puzzling where the trail went. Eventually we did make it to the top. We even managed to find the four foundation pieces for the old fire lookout despite the snow! The following weekend we took a hike in the Columbia River Gorge that we’ve done at least a few times before: the Horsetail Falls/Oneonta Gorge loop. 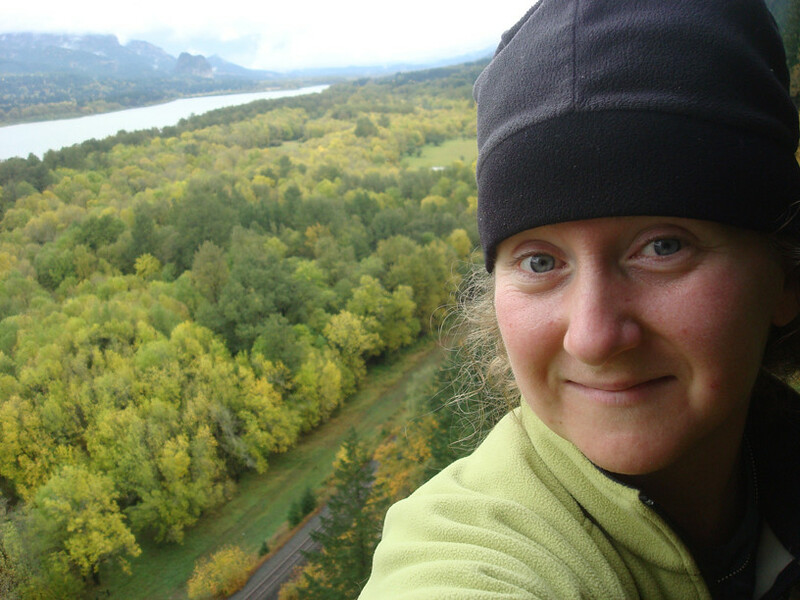 In the past we’ve hiked it when there was snow and ice on the ground, so this was pretty uneventful except for seeing all the gorgeous fall foliage in the gorge. One trail I’d like to do, which parallels the Clackamas River for over seven miles, requires a buddy with a second car (or over 14 miles of hiking) which is kind of difficult for me to secure. And some of the in-town hikes, like Oaks Bottom, are positively blasé—Atticus and I could save those for the worst of Portland’s winter weather and do perfectly okay. 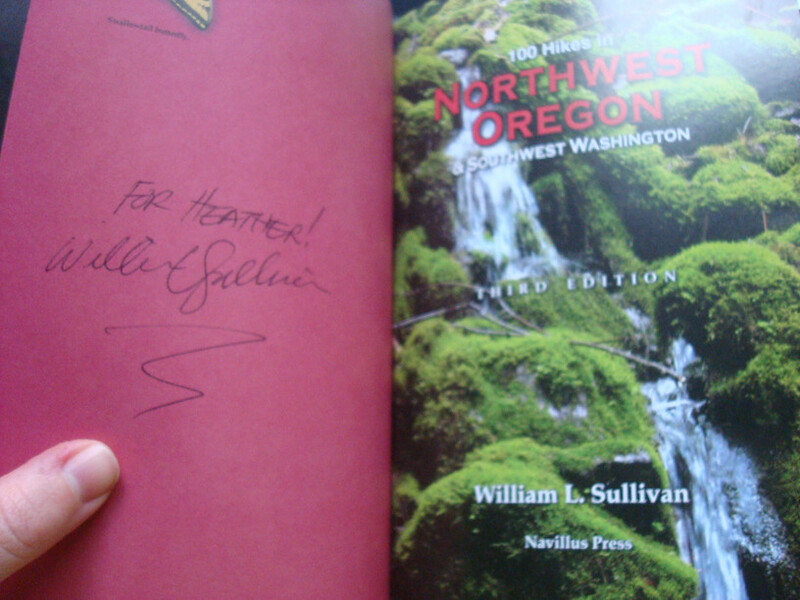 Now and again I wonder if maybe I shouldn’t have bought Sullivan’s Hiking Oregon’s History instead. Am I going to continue working on these hikes? I’m largely undecided. So far they’ve been a good way to get out of town and have a nice outing with Atticus once a week. Adventure, new ideas, and exercise have been the best benefits so far, and until the trail conditions outweigh those, I imagine we’ll keep up with it as much as we can. Oregon’s governor John Kitzhaber is a great guy. He unites an Oregon traditionally divided between metro (liberal) and rural (conservative) areas. He has been a cowboy-hat wearing rural doctor, yet he’s a Birkenstock-wearing liberal who has created initiatives for forest health. While visiting Helena this weekend though, my desire to be a Montana resident skyrocketed due to Montana governor Brian Schweitzer. What’s Schweitzer’s secret weapon that threatens to steal me away from Oregon, you ask? A spunky little border collie named Jag. On press releases Jag is described as the Governor’s “constant companion and special assistant.” I asked Schweitzer’s office if that means he’s an assistance dog—I was told no. According to the Helena residents I met, Jag goes with Governor Schweitzer almost everywhere. He helps the governor sign bills. Jag has an email address (jag@mt.gov), which means he must also have some administrative assistance translating and typing responses (no thumbs!). Jag is even the subject of a children’s book: First Dog: Unleashed in the Montana Capitol. In the great tradition of dog biographies such as Millie’s Book, Seaman’s Journal, and even Virginia Woolf’s Flush: A Biography (about Elizabeth Barrett Browning’s dog), the book is great fun and features strikingly real art, down to Jag’s two-colored eyes! Over at the Montana Historical Society, just a few blocks from the Governor’s mansion, word is that Jag can sometimes be a little protective of the governor—true to his border collie nature. When the Governor came to an event at MHS, Jag couldn’t go into the exhibit area and was not terribly happy about it. Schweitzer’s office has a postcard sporting a photo of him with Jag, for mega-fans like me. Call during normal business hours—they’ll send you one! They even rubber-stamped Jag’s pawprint on the back of mine. If I had time to return to Helena in the next few weeks before returning home to Portland, I think my goal would be to meet Jag. Border collies aren’t my favorite breed, but they’re a short step away from my beloved Australian shepherds. 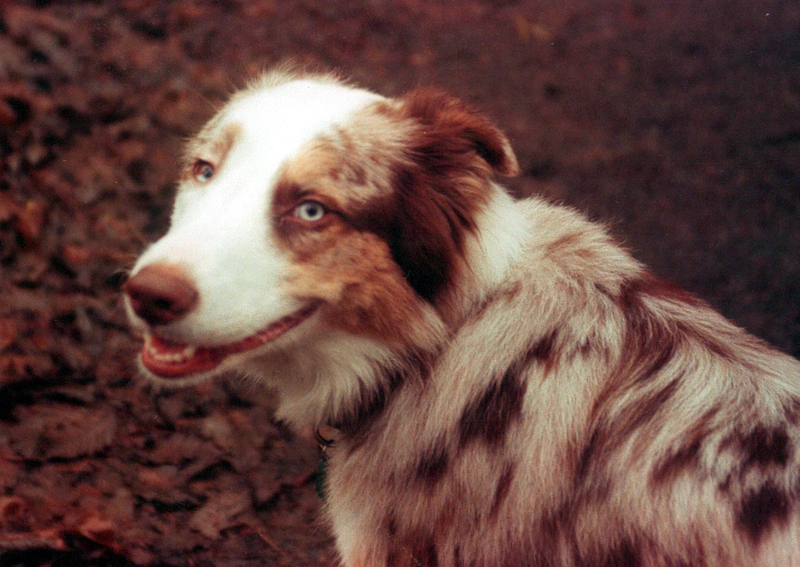 The two breeds share many physical and behavioral characteristics, from sporting two-color eyes and a huge smile to the “velcro dog” phenomenon. (That’s what Aussie owners call it when our dog won’t leave our side.) Jag seems like he is a great little dog. Kitz, unless you’re planning to get an Australian shepherd, Schweitzer wins this round—paws down.